Serena Williams has thanked Wimbledon chiefs for giving her the controversial seeding that divided the tennis world ahead of the grass-court Grand Slam. Williams’ seeding has been a hot topic after the seven-time Wimbledon champion’s tentative return to action following the birth of daughter Alexis Olympia in September. The 36-year-old played her first Grand Slam for over a year at the French Open last month, reaching the fourth round before a shoulder injury forced her to quit ahead of her clash with Maria Sharapova. Williams is ranked 181 after her maternity leave and French Open chiefs decided against seeding her. However, Wimbledon officials felt the former world number one’s record on grass was so superior to her rivals that they seeded her 25th to ensure a balanced draw. Slovakian world number 32 Dominika Cibulkova was bumped from the seeding group as a result and complained bitterly in advance of the decision. Other female stars are reported to be unhappy with Williams’ seeding, but some, including two-time Wimbledon winner Petra Kvitova, insist they have no problem with the move. Serena wasn’t sure she would be seeded for Wimbledon, which starts on Monday, and the 23-time major winner admitted she could have no complaints. “I think I would be very ungrateful if I sat here and said it was too low, to be honest. So not at all,” Williams told a press conference at Wimbledon on Sunday. “I don’t at all feel that way. In fact, I was pleasantly surprised. I came in here expecting that maybe I wouldn’t get a seed. “I do know Wimbledon tends to kind of beat to their own drum. That’s kind of one thing that’s been able to set them apart. “It was a little bit in the back of my mind, that I would have a chance, but I didn’t put that on it. Williams’ return to Wimbledon carries extra significance as it is 20 years since she made her debut, reaching the third round as a raw teenager. “Was it 20 years ago? Wow, 20 years ago I can’t say I thought I’ll be here 20 years later,” she said. “I can’t say I remember my first match. I’m definitely going to try to YouTube that! Williams had a heart-warming moment on Centre Court earlier in the week when she took Alexis Olympia onto the turf where she has enjoyed some of the finest moments of her career. 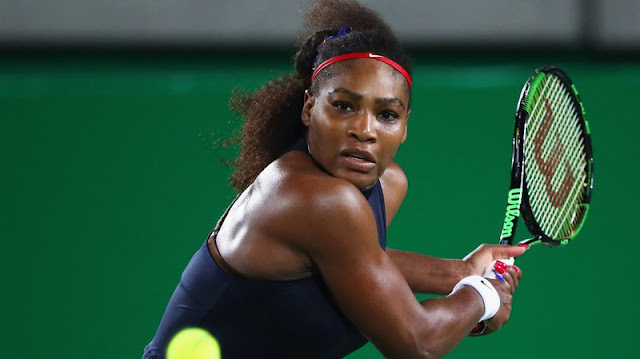 Serena has appeared in nine Wimbledon singles finals and, together with sister Venus, transformed the profile of women’s tennis with their inspirational rise from the mean streets of south-central Los Angeles. “I did take her to Centre Court early on this week when I was here. I don’t know. I got a little emotional when I was telling her a story about a girl who had a big dream,” she said. “I started getting choked up. I never felt that before, you know. “Just taking all that moment and having the opportunity to share it with my daughter and my future. “It was more than I expected. I didn’t expect to suddenly get emotional. So that was really, really nice. We’ll always have that memory. “We’ll always have that footage of her. I’ve been to the other Grand Slam, but I never actually brought her on-site. This was the first one.